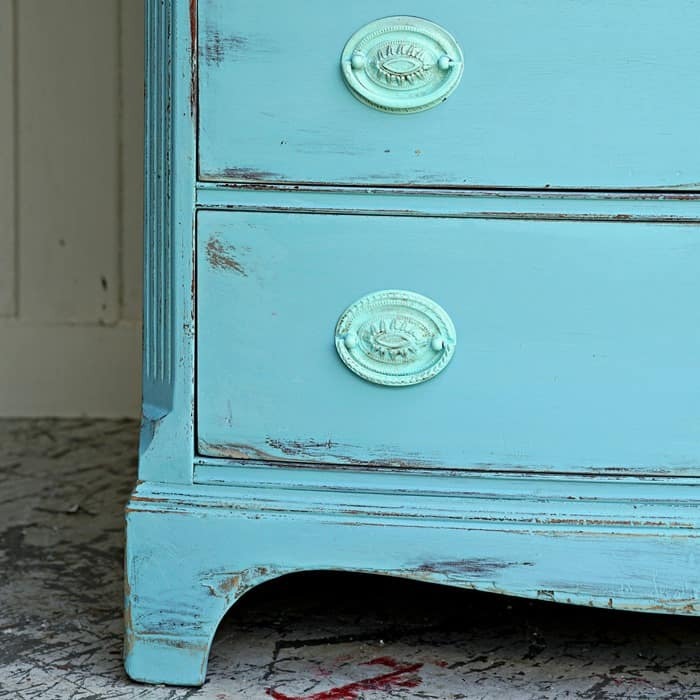 Damaged furniture can be made beautiful by simply playing up the flaws. Damages like missing veneer and big gouges in the finish are the best. Did I just say I like these flaws? Yes, because they distress beautifully after a nice coat of paint. Most of the furniture I buy is damaged in some way. Very seldom do I buy a piece in excellent condition. There are two reasons for this. The first reason is that I don’t want to paint furniture that’s in really great condition. I get in trouble for that. The second reason is that my furniture budget is small. I don’t pay much for a piece of furniture because when I resell it I don’t make much of a profit. Can you tell that in the photo above the hardware is aqua colored? I’ll tell you how the color came about. Today is the Furniture Fixer Upper tour so let’s get started. I bought the chest of drawers at a local used furniture store. I don’t remember how much I paid for it but I think about $75. It’s hard to get inexpensive used furniture. See the missing hardware? I have to find a solution for that. The missing hardware was nothing compared to the eaten up wood and veneer. 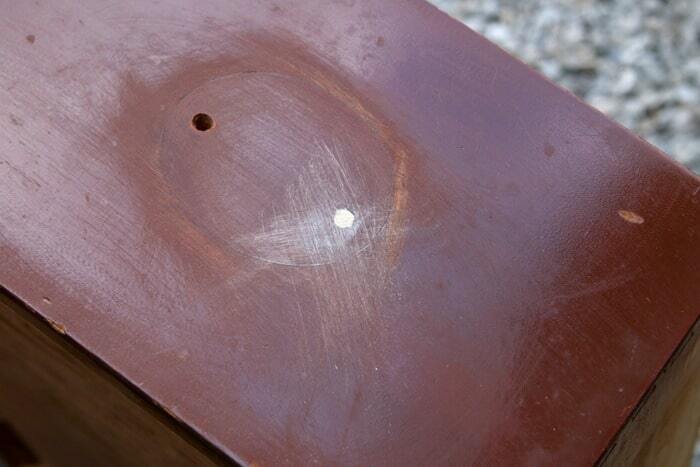 The areas around the bottom of the chest were all chewed up and so were some of the drawer fronts. 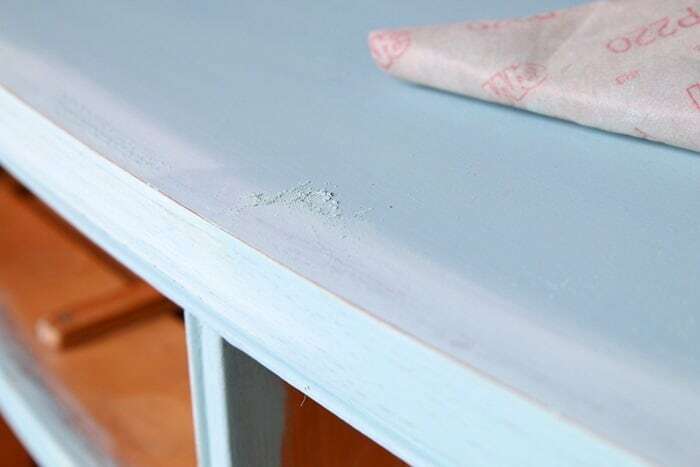 The first job was to try to smooth out the rough areas or at least remove some of the raw edges from the damaged furniture. I used 80 grit sandpaper by hand to clean up the rough areas. Next I vacuumed the dust and spider webs from the outside and inside of the chest. There was one missing drawer pull and one without the handle thingie. I searched my hardware stash and actually came up with some pulls that were almost identical to the ones on the chest. Only problem is the screw holes were different. After looking at several options I decided to paint wood knobs and use those on the second drawer. That means I had to fill one screw hole on each side of the drawer. 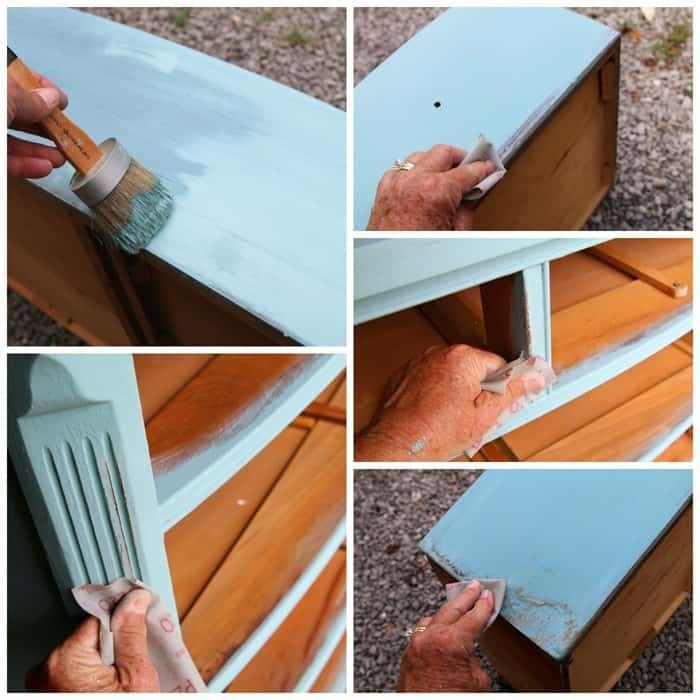 I used Elmer’s wood putty to fill the holes and sanded it flush to the drawer once it was dry. 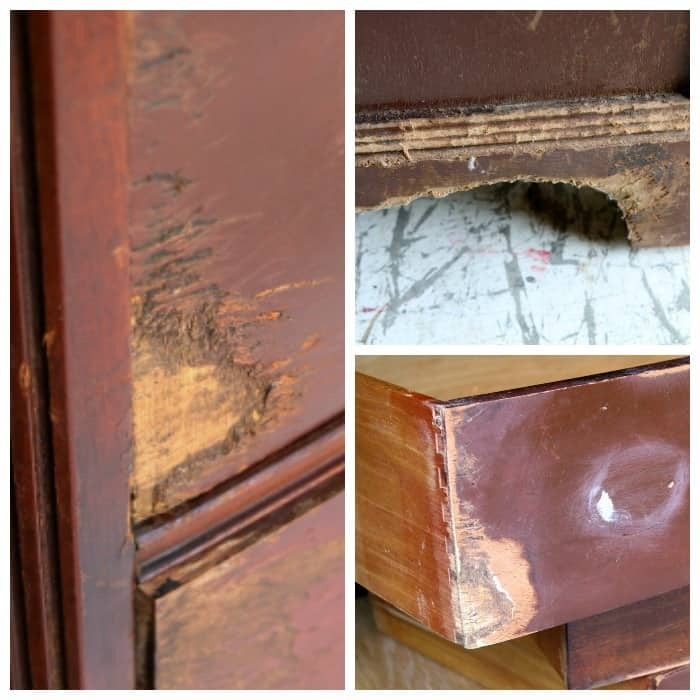 If you’ve been holding back on a furniture project because of hardware issues….don’t. You can deal with them. If you need help read my How To Replace Furniture Hardware post here. Now that the chest of drawers is all prepped time to select the paint. I decided on a flat paint finish just because I’m loving the flat look right now and I also wanted a beachy vibe. 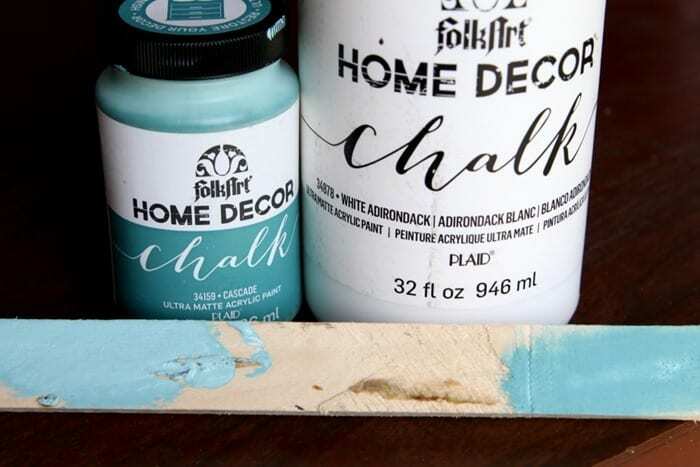 I pulled the Cascade color FolkArt Home Décor Chalk from my paint shelf and brushed a sample on a paint stick. 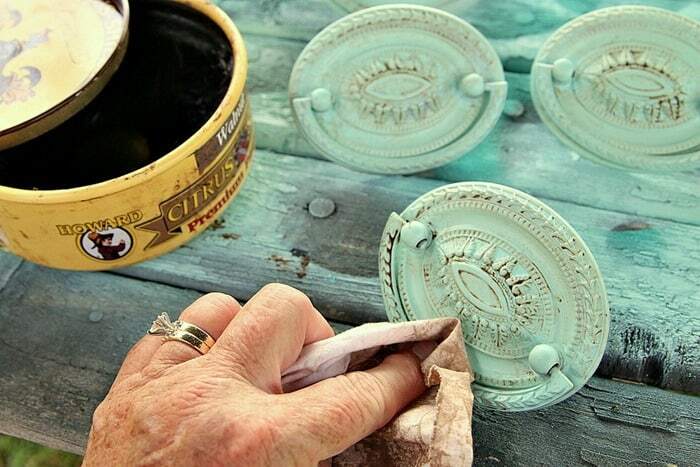 It was a bit dark for this project so I mixed a bit of White Adirondack Home Décor Chalk with it. The lighter color on the left is the color I went with. 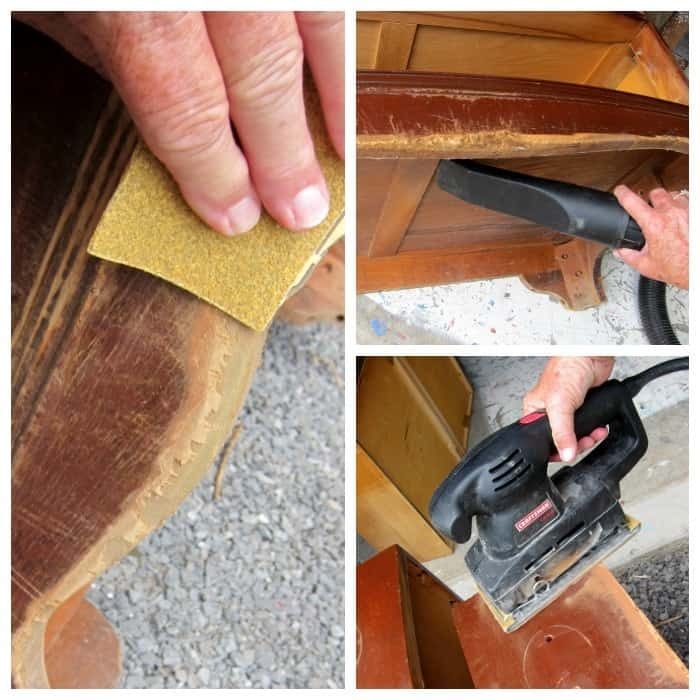 Once the paint was dry I used 100 grit flexible sandpaper to distress all those areas that were chewed up and damaged. 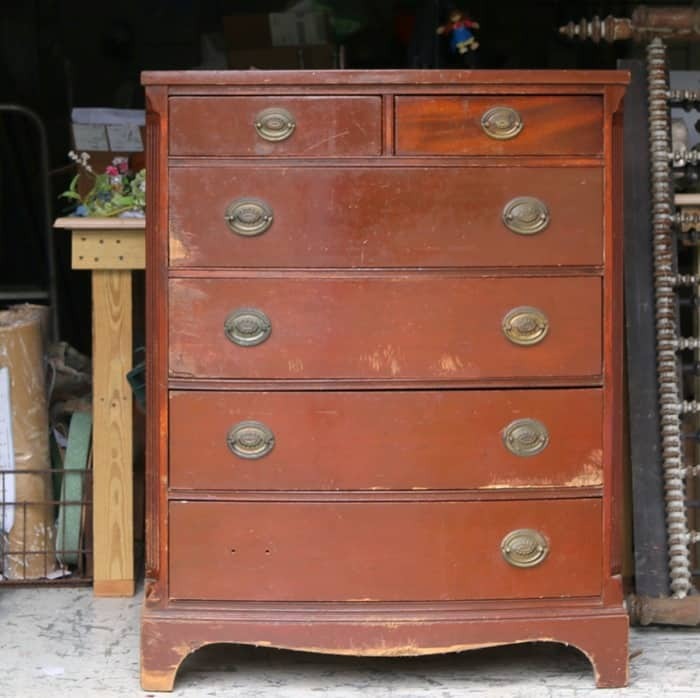 Then I moved on to the edges of drawers and the body of the chest. I haven’t used my electric sander to distress paint in a while but I wish I would have pulled it out for this job. 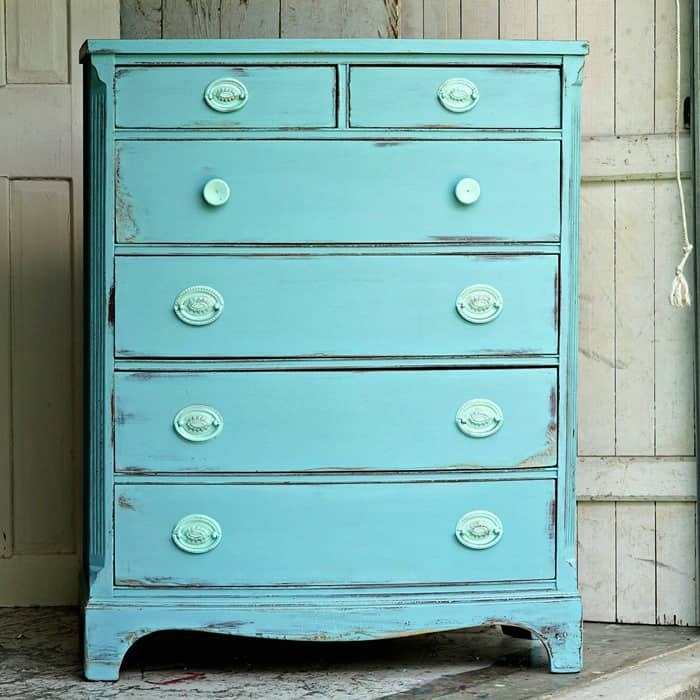 The chalk paint really adhered to the chest….which is good…..unless you are distressing the paint. Paint choice for the hardware was an issue. White hardware was not the look I was going for. Too much of a contrast and not beachy looking. I tried three colors of spray paint, turquoisy blue, aqua, and green sea glass. I ended up using Krylon Colormax in Aqua which was a very pale green with a very bright sheen. The paint finish almost had a metallic look to it. I cut the shine with Howard’s Wax in Walnut. It’s as simple as rubbing it on and letting some of it settle in the grooves. After it dries shine it with a dry lint free rag. Does the chest look beachy to you? Do you like the distressed areas? Do you see what I mean about working damaged furniture flaws and all? What about the color of the hardware? I wish you guys could see this piece in person. The photos just don’t do it justice.The colors didn’t want to photograph well or more like……I didn’t know what I was doing. 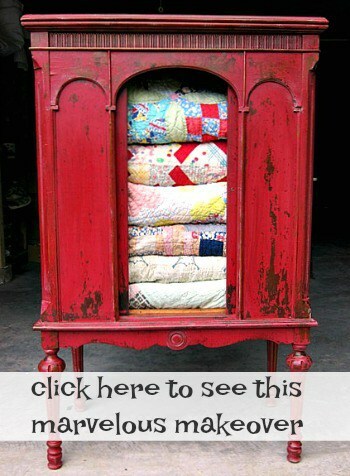 Find the chalk brush, paints, and supplies used in this project on the Petticoat Junktion Amazon Page here. I’m very happy with the final finish. What do you guys think? 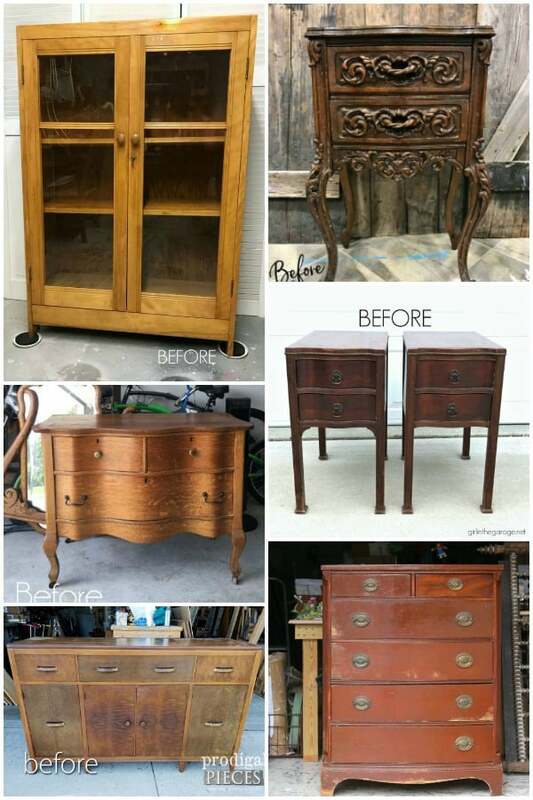 Leave a note and take the Furniture Fixer Upper tour by clicking the pink text links below the “before” photo collage. My friends have some extra great makeovers this month. 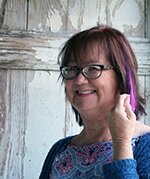 Such a fun and cheerful makeover Kathy! 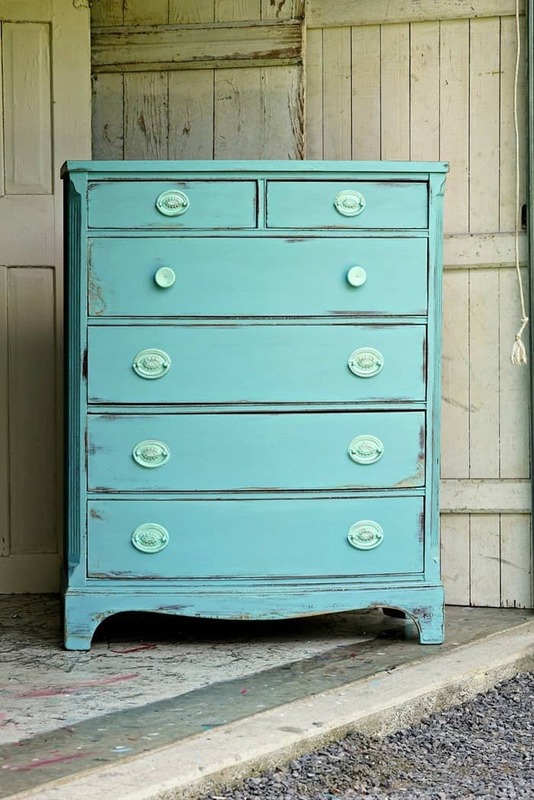 Love the beachy turquoise and distressed finish. I love the colors you used, Kathy especially the contrast with the aqua pulls! I tell ya, that wreck of a dresser was lucky to have you, the furniture whisperer, come along to bring it back to life. Beautiful! I love this. I also was not aware of these brushes you are using. I have a round wax brush, but have not see these for painting. Ready to order them! Yikes, I forgot to list where you can get this awesome brush. Here is the Amazon link https://amzn.to/2tKrTRv (affiliate link). Oooh…love that pretty colors and how the pulls have the slight contrast. Beautiful, Kathy! You made the imperfect “perfect”, I love it! Great save Kathy! 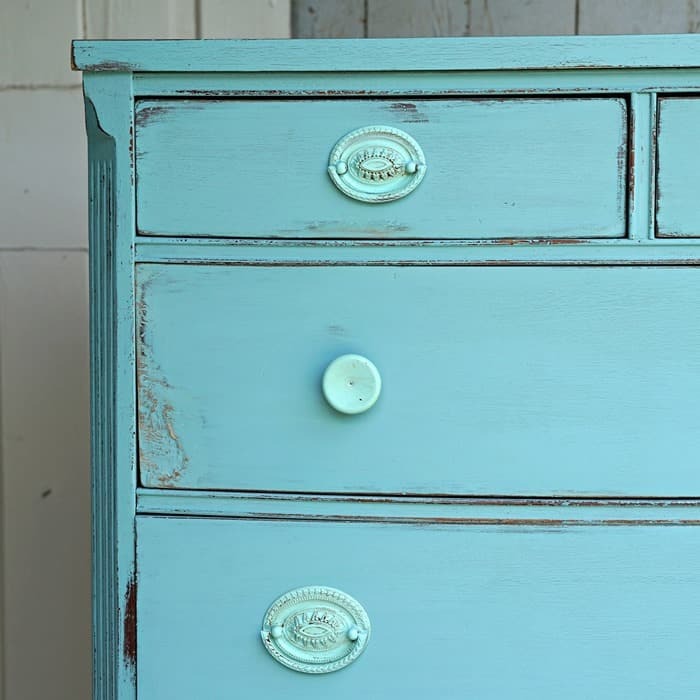 Love the beachy color!